For information about using commands instead of the OpsCenter UI to stop DSE on a node, see Stopping a DataStax Enterprise node. From the Other Actions menu, click Stop. Tip: The Stop option is also available from the Actions menu in the Node Details dialog. 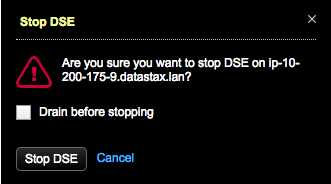 The Stop DSE dialog appears. Optional: Indicate whether to drain the node before stopping.